As you'll see below, I am an established and successful pianist, having performed across the UK, and also an acclaimed recording artist with many exciting projects coming up in 2014-15. I am about to move to Salisbury, in August, to take up a new position as Accompanist and Piano Teacher**Removed By Admin**. Upon leaving the Royal College of Music in London, in 2011, I quickly became in demand as a performer and have enjoyed a top flight career which has taken me across the UK as a recitalist, concerto soloist (with conductors such as Sian Edwards), and recording artist. Venues I credit myself with include the Wigmore Hall, Cadogan Hall, St John's, Smith Square, St James's Piccadilly and the Purcell Room (Southbank Centre). I've also worked as a freelance keyboardist with the London Philharmonic, and the City of London Sinfonia. In 2013 Toccata Classics released my album of Scots composer Ronald Center's piano music, and a second volume of this will be recorded later in 2014 along with a disc of music by Ronald Stevenson. Scottish pianist Christopher is in demand as a recital artist, concerto soloist and collaborative pianist, with concert engagements taking him to a wide range of venues across the UK. Recent performances have included those given at St James’s Piccadilly, the Wigmore Hall and St John’s, Smith Square in London, and he continues to give numerous recitals for music societies under the auspices of the Countess of Munster Musical Trust. Christopher’s concerto appearances have seen him work with conductors such as Sian Edwards and the Milton Keynes City Orchestra in Bach’s Keyboard Concerto in D minor, along with numerous amateur orchestras in concertos by Shostakovich, Beethoven, Schumann and Haydn. 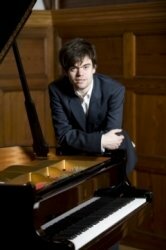 A strong advocate of contemporary and lesser-known repertoire, Christopher will begin a survey of the piano works of Scottish composer Ronald Center for Toccata Classics in Spring 2013. Born in Elgin in 1986 and brought up on Speyside, I studied piano and violin locally before entering St Mary’s Music School, Edinburgh aged 13. One year later I took top honours in the Moray Piano Competition - a victory which sees me as the youngest ever winner to this day. In 2005 I entered the Royal College of Music as a Foundation Scholar, and remained there under the tutelage of Andrew Ball until 2011, successfully gaining a First Class BMus (Hons), and the MMus and Artist Diploma’s with Distinction. Until June 2014, I maintained two teaching practices in London, one being at a coveted private school in Croydon, and the other at a specialist performing arts centre as part of a thriving inner-city comprehensive. Aside from that, I hold a position with **Removed By Admin** of Music in Greenwich (weekends), and recently I completed a one-year tenure of the Richard Carne Junior Fellowship in Performance at Trinity Laban Conservatoire of Music and Dance, Greenwich, where I curated performances, and coached students working in the Piano & Organ department. So, my experience of teaching is wide-ranging, encompassing beginners of all ages to those who are on the threshold of promising musical careers. Lessons are delivered on a one-to-one basis. Following the initial consultation (subject to the usual hourly rate), I will form a rough plan as to how to progress with the pupil over the forthcoming academic term. This will be altered as time goes on to accommodate the pupil's abilities and interests, and indeed to better suit them as I get to know them. It's a flexible approach which I adopt, and a light-hearted, fun one as well. Above all, I seek to attain the highest of musical and technical standards with everyone I teach, and to always inspire them.